Brazilian midfielder Kaka displays his Number 8 new jersey of the Real Madrid during an official presentation at the Santiago Bernabeu stadium in Madrid, Spain, on June 30, 2009. MADRID -- With the crowd chanting his name, Kaka received a roaring welcome Tuesday when he was introduced at his new home of Real Madrid before at least 50,000 fans. 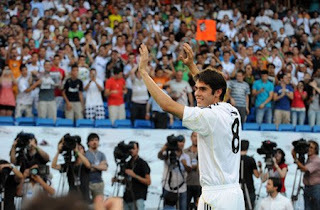 "I'm very happy about this new step in my career at Real Madrid," said Kaka, who will wear jersey No. 8. "Viva Madrid!" Kaka, who passed his medical earlier Tuesday, and Cristiano Ronaldo are Perez's major summer signings as the team tries to make up for a season without a trophy. "There are no words for today, it's an unforgettable day," Kaka said through a translator. "All of this is a great honor and responsibility, and not a negative responsibility but a positive one. I hope we can win titles and many victories." "We're compatible players and I think we'll be able to play alongside without a problem," said Kaka, who helped his country to victory at the Confederations Cup in South Africa, where he was honored as the tournament's best player. 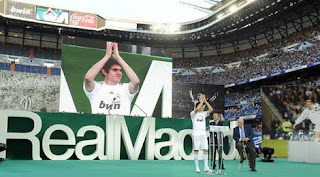 Kaka took the stage before a backdrop featuring photos of iconic Madrid players Alfredo di Stefano, Raul Gonzalez, Juanito and Zinedine Zidane. Accompanied by a young fan donning the first Kaka jersey, he toured half the 80,000-capacity stadium to sign autographs and salute the pumped-up crowd. Madrid failed to get past the first knockout stage of Europe's top-tier competition for the fifth straight season and lost the league to bitter rival Barcelona. Barcelona won the Champions League, Spanish league and Spanish Copa del Rey all in one year, the first Spanish team to capture all three titles in a season. Kaka believes Madrid is in a great position to compete after finishing runner-up last year. "Madrid has everything in terms of a fascinating team. And it's always been a reference for great players," Kaka said. "The project is very good. I can't wait to play." 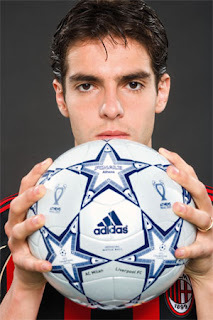 Kaka, whose full name is Ricardo Izecson Dos Santos, won a Champions League, Serie A, Club World Cup and two European Supercups in his six seasons at Milan, which he joined from Sao Paulo in 2003. 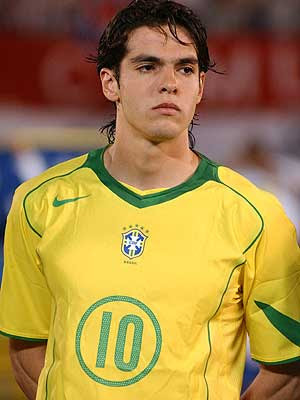 Kaka was also a member of Brazil's World Cup-winning team in 2002. Perez has splashed out $333 million this summer, including Valencia defender Raul Albiol, in a bid to turn the page on a season marred by former president Ramon Calderon's resignation over a vote-rigging scandal. Even Perez was given an ovation when he took the stage, with chants of "Florentino" ringing out for the first time since his initial reign from 2000-06. "We believe that this club can become the best club in the world, again," Perez said. "He is a unique player ... and Kaka is with us." 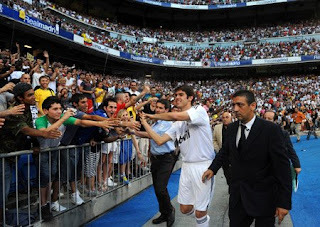 MADRID - Real Madrid's new 'Galactico' signing Kaka received a triumphant welcome from tens of thousands of fans as he was presented at the club's stadium on Tuesday. "I want to write my name into the history of this club," the Brazilian midfielder told the crowd at the Santiago Bernabeu stadium in the Spanish capital, as he showed off his new "number eight" shirt. The Brazilian, whose full name is Ricardo Izecson Dos Santos Leite, was signed for €65 million ($A113.3 million) from AC Milan in early June. Real president Florentino Perez praised Kaka as "one of the best players in the world", for his "impeccable behaviour" and as "one of the icons of our time." "We want that this club will one day be elected the best in history," he said. The 80,000-capacity stadium appeared mostly full for the presentation, with many of the fans waving Brazilians flags. Kaka, 27, arrived in Madrid earlier on Tuesday with his father from South Africa, where he won the Confederations Cup with Brazil. He later passed a medical exam at the club. He "is in perfect condition to play football at the highest level," Real said in a statement. Another of the so-called "new Galacticos" at the club, Cristiano Ronaldo, was signed from Manchester United for a world record €93 million ($A162.11 million), and will be presented to the supporters on July 6. Perez returned as president of Real last month. He first led Real from 2000 to 2006, when it earned the nickname "Los Galacticos", winning the Primera Liga twice and European Champions League with such stars as Zidane, Ronaldo, Luis Figo, David Beckham and Michael Owen. Kaka will be unveiled as a Real Madrid player this evening after passing his second medical with the Spanish club. The 27-year-old had already completed a first set of medical tests with Madrid while on international duty in Brazil prior to the official announcement of his transfer from AC Milan. 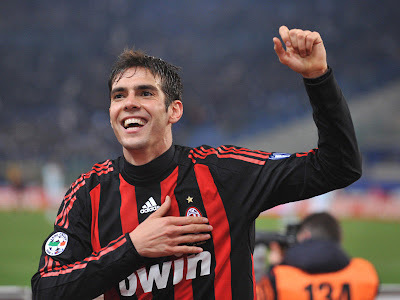 Kaka, who Madrid have paid Milan a fee reportedly in the region of £56 million for Kaka, who was instrumental as Brazil won the Confederations Cup. He hopes to add to his trophy tally at Real Madrid, and says the Spanish giants were always a more tempting option than Manchester City, who tried to sign the player in January. "I was very flattered by Manchester City's interest in January but it is just a project at the moment. And with projects sometimes you don't know how long the investment will be there for," he said. "Lots of smaller clubs have periods of spending big money. But suddenly the investment stops when the owner decides to do something else. Or sometimes it stops because of other reasons like a failing economy. "Things can be great one moment and not so great the next moment. The organisation can collapse like a pack of playing cards. I felt the time was right for a change and Real Madrid is the club for me. "It was not about a difference of quality between the Primera Liga and the Premier League. Real will always be a big club. Nobody can take away their history and their nine European Cups." Real Madrid have announced that Kaka has passed his medical and is in perfect condition after he flew in to the Spanish capital on Tuesday morning. Expectations are high after the player who cost €67 million from AC Milan arrived in the city ahead of the presentation at the Santiago Bernabeu in the evening. "Kaka has passed his medical checkup prior to his official presentation scheduled for 20:30 CET at the Santiago Bernabeu," the club's official website reported. "The player underwent a complete battery of tests performed by Real Madrid's Medical Services team at Sanitas La Moraleja Hospital. "Ricardo Izecson Dos Santos Leite "Kaka" landed at Madrid's Barajas International Airport at approximately 7:30 this morning. The first stop on today's agenda was Sanitas La Moraleja Hospital, where he arrived at 9:30 accompanied by his father. "Kaka then underwent the required medical checkup, which he passed with flying colors according to Real Madrid's Medical Services team. Tests included blood and urine samples, an electrocardiogram, an echo, an MRI, a thorough locomotor test and x-rays. "Chief of Real Madrid's Medical Services, Carlos Diez confirmed that Kaka is the perfect example of a young man who takes good care of himself and does everything possible to stay healthy. Today's tests confirmed that the player is in perfect condition to play top-class football as proven in the Confederations Cup. The shot-stopper extraordinaire is hoping that his new team-mates will help the club return to the pinnacle of world football. Real Madrid’s home-grown Galactico, Iker Casillas, is looking forward to the new season with anticipation - and rightly so, now that Los Blancos have been strengthened by signing the two most recent Ballon d’Or winners, Kaka and Cristiano Ronaldo. Many of the club’s rivals believe that the side could struggle due to the high expectations and the massive squad changes, but Casillas is optimistic that quality will prevail in the end. “I hope that they [Kaka and Ronaldo] can contribute at the level that they’ve been showing and that they will arrive with a lot of desire to play and win titles for Real Madrid,” he told reporters upon touching down at Barajas Airport after returning from the Confederations Cup in South Africa. Casillas was then asked if Valencia striker David Villa would be the next galactic signing for Florentino Perez. Rafael Benitez will seek talks with Xabi Alonso this week though the 27-year-old has given the strongest suggestion yet that he sees his future at the Bernabeu, rather than Anfield. His latest disclosures, in Spain's Don Balon magazine, made reference to Benitez's willingness to sell him to Juventus last summer, a move which would have financed Gareth Barry's arrival and which rankled deeply with Alonso. "Last year I was close to joining Juventus," Alonso said. "It's always good that several clubs want you, but I can't do too much about it. I know that I have to do my work well and, in the future, I'll decide what I have to decide." Asked if his would be an "impossible marriage" with Real Madrid, who covet him, he insisted: "No, it does not have to be." Alonso was also cool in his descriptions of his relationship with Benitez. "My relationship with Benitez is professional," he said. "I've already been in England five years and the truth is that I have adapted well. I'm happy there, though I do miss certain things from Spain. I cannot rule out a move or even staying in the Premier League." Real Madrid remain interested in a £20m move for Alonso. Javier Mascherano is equally in demand with Barcelona seemingly not put off by the £50m price tag Benitez put on him. Despite giving defensive midfielder Yaya Touré a new contract Barcelona president Joan Laporta has reiterated his interest in the Argentina captain. "Mascherano is a close friend of Leo Messi. We will see what happens. He's a player I like very much," he told a Spanish radio station. Real Madrid have announced that they will formally present new signing Kaka to the press and the fans on Tuesday evening at 20:30 at the Santiago Bernabeu stadium. The Brazilian superstar arrives in the Spanish capital from AC Milan, having also just won the Confederations Cup with his national team. This event will bring to an end a chase for Kaka's signature that has taken Madrid years, but one that has finally borne fruit. The Blancos are well-known in the sport for their love of pomp and circumstance, and with thousands of fans expected to turn up to see president Florentino Perez hand over the white shirt to his latest capture, there is bound to be no shortage of a sense of event. Goal.com will bring you the latest coverage from the Bernabeu live as it happens, so join us on Tuesday evening for your first look at Kaka in Spain. Xabi Alonso has refused to rule out a move to Real Madrid this summer and has explained that he has not closed the door on any possibilities amidst reports that he could leave Liverpool. The Basque Country midfielder has been linked with a switch to the Bernabeu this summer, but the rumours have subsided after manager Rafa Benitez stated he wanted the player to stay. But Alonso was asked about his thoughts on moving back to la Primera with Madrid by Don Balon and he revealed that any number of things could still happen. "In respect to all this I have not closed any door and we will just have to wait and see what happens," he told the weekly football magazine. "It is always positive when various teams are said to want you because that is better than nobody being interested, but I cannot say much more. "I know that I have to keep playing well and will be able to decide what happens next whenever it arises. "I do not think a move to Real Madrid is impossible, but I would also have no regrets at all staying at Liverpool." Benitez has been unhappy that both Alonso and Javier Mascherano have been linked with moves to la Primera, but the Spain international does not think the reports will affect their relationship. "My relationship with Benitez is professional, just like he has with any other player. I believe that is how things will stay too," Alonso continued. "I am happy in England and have adapted, but I do miss certain things from Spain. I cannot rule out a move or even staying in the Premier League. "I am happy there and although I was a bit homesick at the start, I am still there. "This situation is normal for me because I know what is actually happening, away from what is being reported. For that reason I am perfectly calm." Real Madrid are now the clear favourites to sign the 21-year-old Karim Benzema after tabling a £28 million bid. Manchester United will have to hope that French club Lyon are holding out for £30 million as they plan to hijack the transfer. Wigan chairman Dave Whelan is now ready to confirm an Antonio Valencia deal that would take the winger to Manchester United for £16 million and quadruple his current wages. However, it's believed Ferguson would rather get his hands on Benzema or Ribery in favour of Valencia, who would join United only if those transfers are scuppered. Arsene Wenger hopes the French influence at Arsenal will lure Karim Benzema to the Emirates Stadium but he will have to move soon after Real Madrid offered £27 million for the striker. Mega-rich Real have moved to add Lyon's Benzema to their other stellar summer signings, Cristiano Ronaldo from Manchester United and Kaka from AC Milan. United also want the France striker but Wenger trusts the presence of Benzema's international team-mates William Gallas, Bacary Sagna, Gael Clichy and Mikael Silvestre could tempt the 21-year-old to join the Gunners. Any bid from Arsenal is likely to depend on Wenger selling Emmanuel Adebayor, who is wanted by Milan. 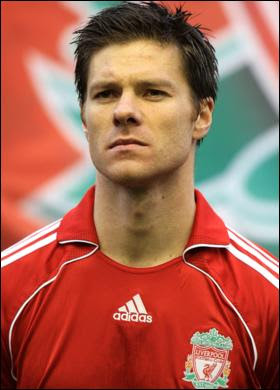 Xabi Alonso insists a move to Real Madrid is not impossible, despite Liverpool's determination to hold on to the midfielder. Bernabeu president Florentino Perez has made no secret of his admiration for the Spain international. In an interview with Spain's Don Balon magazine: 'Last year I was close to joining Juventus. I do not have a defined career plan. 'It's always good that several clubs want you, it's better than nobody wanting you, but I can't do too much about it. 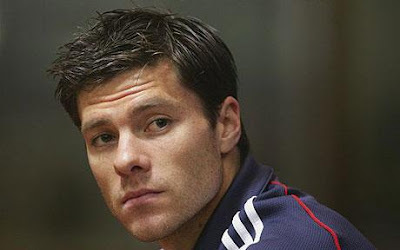 Alonso is said to have been disappointed last summer that Liverpool were prepared to sell him to fund a move for England midfielder Gareth Barry, then at Aston Villa. And the former Real Sociedad player's description of his relationship with Benitez hardly gives the impression of warmth. 'My relationship with Benitez is professional, like he has with any other player,' he said. Alonso believes Liverpool have improved significantly since he came to England in 2004 and he believes they are closing the gap on Manchester United and Chelsea. 'In my opinion, the team has progressed, but in the end we did not win any titles, so we cannot be happy or satisfied,' he said. 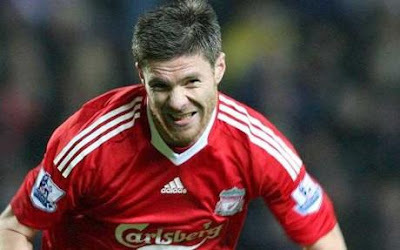 Though he insists he is settled in Merseyside, Alonso admits to occasionally suffering homesickness. Reports in Spain suggest Alonso will speak with Benitez this week to try to resolve his future. 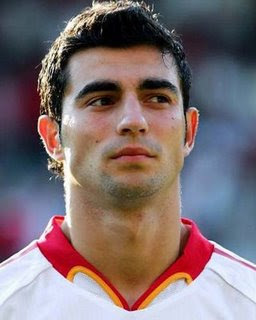 Madrid had hoped to sign him for £20million while Benitez has tried to price him out of the market by asking for £50m. 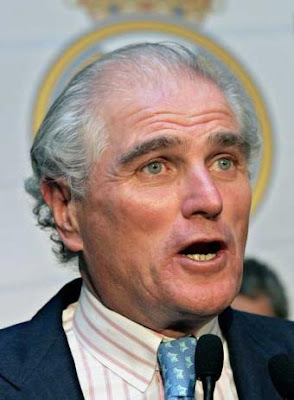 Ramon Calderon could have made up to €24 million in just over two years as president of Real Madrid from his cut of the club's transfer fees, according to a report. Marca stated on Sunday that the former Bernabeu leader had pocketed €4 million from Lassana Diarra's move to the club alone, and the paper have now revealed he has made much more. Commissions to agents, players and others involved in football transfers are not unusual, but the quantity earned by the former Madrid chief has raised eyebrows in Spain. Over eleven transactions that occurred during his spell at the helm saw Calderon earn well over €1 million each time and the details of each are set to be publicised. According to Marca, one deal that has come to light is Fabio Cannavaro's €20 million switch from Juventus in 2006, which saw Calderon earn 16.7 per cent of the fee, totalling around €3.34 million. Calderon was forced to resign in January of this year and the interim president, Vicente Boluda, demanded an exhaustive investigation into all the club's accounts. Real Madrid and Manchester United have finalized terms for Cristiano Ronaldo's transfer from the English champions to the Spanish league powerhouse. "Real Madrid CF and Manchester United have signed the definitive agreement for the transfer of Cristiano Ronaldo to the Spanish club on July 1," Real Madrid's website said Saturday. "The player will stay at Real Madrid for six seasons. 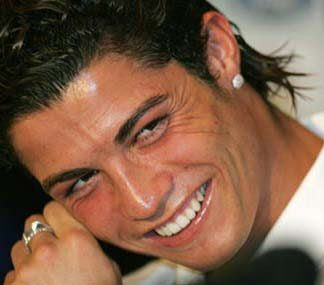 Ronaldo will be presented at the Santiago Bernabeu on July 6." United also confirmed finalizing the deal on its website. In early June the Red Devils accepted a world record $151.7-million Cdn transfer bid from Madrid for Ronaldo, the current FIFA world player of the year. The Portuguese winger almost joined the "Galacticos" last season, before United manager Alex Ferguson persuaded him to stay on and help the side win its third straight Premier League crown. Since Florentino Perez returned as president in June, Madrid has made a huge splash in the transfer market, also signing Brazilian star Kaka from Italian side AC Milan and Spanish international Raul Albiol from Valencia. Perez was responsible for bringing superstars Zinedine Zidane, David Beckham and Luis Figo to the Bernabeu stadium in his first stint as president. The Galacticos won Spanish league titles in 2007 and 2008 and are looking to get back on top after Barcelona won the past season. Spain captain Iker Casillas was satisfied to see the European champions end their very first Confederations Cup excursion on a winning note, after pipping South Africa 3-2 to clinch third place in the competition. La Furia Roja had the demoralising task of bouncing back after the disappointing defeat to the United States in the semi-finals, but the Real Madrid shot-stopper was proud that his team-mates managed to return to winning ways. “It was very important to win again after our setback against the United States,” he told reporters after the game. “We deserved much more in the semi-finals and losing left a bad taste in our mouths. We didn’t have the luck against the Americans that we had today against South Africa. La Furia Roja had entered the World Cup dress rehearsal as favourites to win the competition, and despite securing only third place, Casillas was still pleased with the overall performance. “On the whole, the Confederations Cup has been a positive experience,” he said. 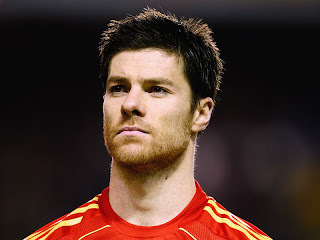 Liverpool midfielder Xabi Alonso’s move to Real Madrid may depend on whether Los Merengues manage to prise David Villa away from Valencia, according to the News of the World. The British tabloid claims that Los Blancos will sign Alonso from Liverpool if they miss out on Villa, as cash-splashing president Florentino Perez is desperate to sign more Spanish players. The striker had appeared destined for a move to the Bernabeu, and indeed has admitted that it is his preferred destination, yet that deal now appears to have stalled. To cloud matters further, European champions Barcelona are believed to have entered the race to sign Villa, meaning his future remains the subject of much debate. Yet, should Madrid ultimately fail to sign the Spainish international striker, the NOTW claims that they will then redouble their efforts to bring Alonso to the Santiago Bernabeu. The paper also adds that Los Merengues will be willing to meet Liverpool’s asking price of €30 million for their midfielder. Whilst Reds boss Rafael Benitez continues to insist that Alonso is not for sale, should the club receive a substantial offer for the midfielder it would have to be taken seriously. The most recent reports surrounding Alonso suggest he has been saying his Anfield goodbyes, which has only hastened speculation he will leave Merseyside this summer. 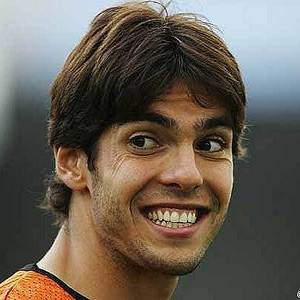 Kaka has warned Manchester City that their summer spending may not bring the success the club craves, after he turned down the club to join Real Madrid in a then-world record £56m move. City's mega rich Arab owners are in the midst of a shopping spree that has already seen Gareth Barry and Roque Santa Cruz arrive at Eastlands and they are set to further add to their pre-season transfer haul by reportedly acquiring the services of Samuel Eto'o and Manchester United reject Carlos Tevez in the next few days. Kaka himself was a target for City last January before opting to stay at AC Milan and subsequently making his move to Spain. Transfer market foes Real Madrid and Manchester United are ready to do battle again over the signature of Karim Benzema. Both clubs have expressed interest in signing the highly rated Frenchman, who currently plies his trade for Lyon. Zinedine Zidane is one of the main proponents of Madrid's advances, but with the club having already spent huge sums of money on the transfers of Kaka and Ronaldo, and potentially also for Franck Ribery, they will not be willing to pay over the odds. Sir Alex Ferguson has already been in contact with representatives of Lyon and asked the club to set a realistic price for the striker. Accoring to reports the club has slapped a £25.5million (€30million) price tag on the 21-year-old. Lyon president Jean Michel Aulas is apparently keen to accept an offer in this region, with Lyon already preparing a move for Porto's Lisandro Lopez. 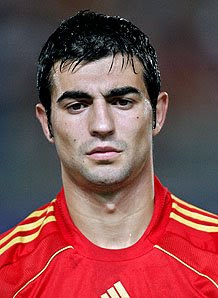 Real Madrid have reached an agreement with Valencia to sign defender Raul Albiol. Albiol, who is currently on international duty with Spain at the Confederations Cup, will undergo a medical next week and, if all goes well, will pen a five-year deal with Madrid. Although no fee has been officially announced, reports suggest that Madrid will pay in the region of €15m (£12.8m) for the centre-back. The news follows confirmation that Real have entered the race to sign Lyon's Karim Benzema. Although the French club continue to insist that he is not for sale, Real are believed to be increasing their efforts to land the €40m (£34m) striker in the wake of Valencia's refusal to let David Villa leave. "The only new fact is that Real Madrid got in contact with us a few days ago to know the position of the club on the subject of Karim Benzema," said Lyon's director of communications, Olivier Blanc. 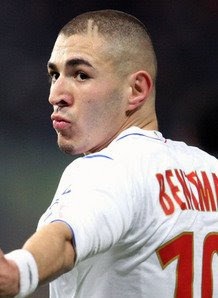 "Benzema and Lyon confirmed their initial desire of him staying here. We know that the player wants to stay a year longer at Lyon and that we want to keep him." MADRID, June 24 (Reuters) - Real Madrid and AC Milan will contest the Santiago Bernabeu trophy in the Spanish capital on Aug. 25, Real said on their website (www.realmadrid.com) on Wednesday. The trophy commemorates former club president Bernabeu and is played each year at the stadium that bears his name with a different team invited each time. Gonzalo Higuain has vowed to prove that he is worth a place in Real Madrid's new look line-up and is aiming to forge himself a spot in Diego Maradona's team for the World Cup finals. The Argentinian forward was rumoured to be one of the players that could leave the Bernabeu at the beginning of the summer as the club sought to sign several big money names. New general manager Jorge Valdano has dismissed the speculation though and has stated that his compatriot has a bright future at Madrid and wants him to play regularly. "I want to prove he isn’t wrong. My contract ends in 2013 and I would like to stay," Higuain told the club's official website. "I am very happy because I’ve had a positive experience, winning three titles and coming close to winning La Liga this year. I’ve gone through different stages. I played a lot this season and I felt great, but I know next year will be tough. "I am young and I still have a lot to learn. I’ve played 100 games with Real Madrid and I want many more because I always aspire to break every record." Despite impressing with Madrid, Higuain has yet to be called up by Maradona to play for Argentina and has vowed to ensure that the situation changes. "I will work hard for that. I dream about playing for Argentina. I think about it all the time. It’s the country where I grew up," he continued. "I felt something unique when I heard the national anthem against Guatemala [in a February 2008 friendly in Los Angeles]." Real Madrid may be receiving plenty of criticism from Barcelona for their efforts in resurrecting the Galacticos empire, but goalkeeper, Iker Casillas was not about to start a verbal volley with his bitter rivals. Instead, he has commended the Catalans giants for the way they obtained the grand treble this past campaign, and for their philosophy of nurturing young talent. “It is clear that Barca play the best football in Europe and at home. They won La Liga, the Champions League and the Copa del Rey and I can only congratulate them, as do the hierarchy at Real Madrid,” he said in an interview with Sport. “There’s certainly healthy envy. Barcelona have always had a footballing model that lasts and they had seven canteranos in the final of the Champions League. Ofcourse that’s a reason to be envious. When he was told that he is one of the more respected Madrid figures around Catalan circles, Casillas replied, “That is good to know. I am glad. The truth is that I am only being myself. The shot-stopper then went on to shower praise on Blaugrana star, Xavi. Finally, Casillas looked ahead to Spain’s Confederations Cup semi-final clash with the United States, and a possible showdown with Brazil in the final. “First, it is necessary to beat the US. Only then can we think about watching the two strongest teams at present go head to head: Brazil, the five time world champions and Spain, who are at the top of FIFA’s ranking,” he concluded. The young defender’s representative has confirmed reports that Los Blancos have made an approach to sign his client. Spanish daily Marca claimed yesterday that Real Madrid had launched another assault for a Valencia player after reporting that they had made a €15 million offer for defender Raul Albiol. Now, the player’s agent, Manuel Garcia Quilon, has confirmed on Cadena SER that talks between the two clubs are in advanced stages and that Los Che will officially unveil their asking price, believed to be in fact around €15m, to the Merengues later today. Quilon went on to assure in the radio interview, “No player at Valencia is intransferable. The only difference between one player from the other is the price. The agent, who also represents full-back Alvaro Arbeloa, declared that the Liverpool man could very well be on his way out of Anfield this summer, with the Santiago Bernabeu looking like a possible destination. “He has one year left in his contract and Rafa Benitez knows that it would be best to sell him off now,” he theorised. Quilon then touched on the subject of another client of his, Ruben de la Red, who is still waiting to be given the all clear to return to football following problems with his heart. “Just like everyone, he is desperate to return to the pitch, but we are still waiting for the medical results,” he revealed.